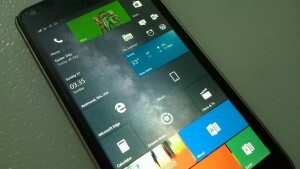 Windows 10 Mobile Build 14322 review on Lumia 640 is here. 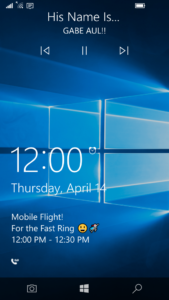 Microsoft pushed Windows 10 Mobile Build 14322 to Windows Insiders in the Fast ring, yesterday. 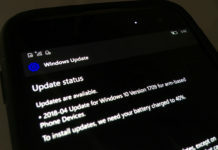 Windows Insiders were waiting for Windows 10 Mobile Build 143xx since several weeks, as Microsoft released Windows 10 Mobile Build 14295 to Windows Insiders in the Fast and Slow ring, last month. 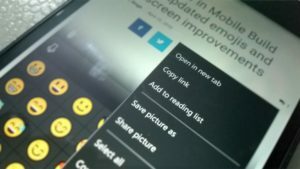 Windows 10 Mobile Build 14322 is the first Windows Redstone build, which arrived with several improvements as well as new features, which no one even expected. Along, with several new features, as usual, there are also some known issues, which are very annoying if you get into the trap of the bugs. On another hand, Microsoft again stated that Lumia 635 with 1GB RAM will soon start receiving Windows 10 Mobile Redstone Builds, as the company is working on it since some months. 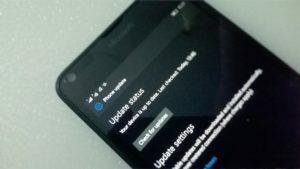 Windows 10 Mobile Build 14322 on my Lumia 640 downloaded very quickly compared to previous Windows 10 Mobile Redstone Builds or even some Cumulative updates. As soon as the downloading process finishes, my Lumia 640 entered into the process of installation. Even, preparing to install process completed in 20 minutes, which is also little faster when compared to Windows 10 Mobile Build 14295. 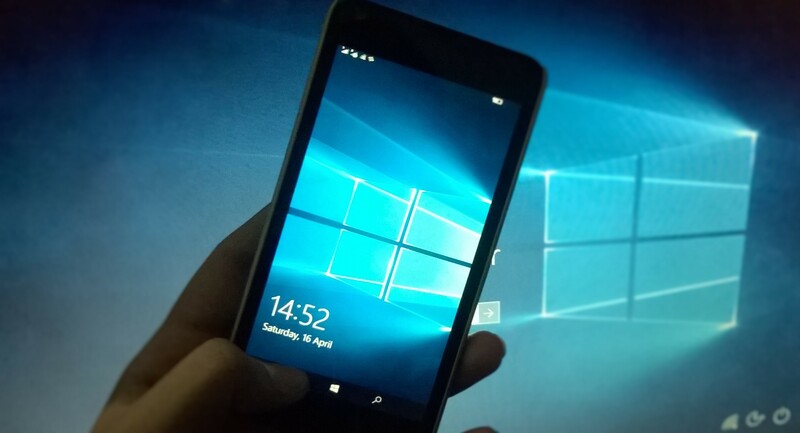 For those who are wondering, we upgraded our Lumia 640 from Windows 10 Mobile Build 14295.1004 to Windows 10 Mobile Build 14322, and there were no glitches. After preparing to installation process, finished, Windows 10 Mobile Build 14322 entered into spinning gears. The process of spinning gears was normal, it took just 15 minutes. However, this time, migration steps took massive 30 minutes compared to 10 minutes in Windows 10 Mobile Build 14295. As soon as the migration steps completed, finally our Lumia 640 showed the start screen with no apps stored in SD Cards working. We restarted our Lumia 640, and almost all app were back but some were stuck at pending. However, it is a known issue in Windows 10 Mobile Build 14295. As stated earlier, Windows 10 Mobile Build 14322 is one of the best Windows 10 Mobile Redstone Build, I have ever seen in my life as a Windows Insider. There are fixes, known issues, But finally, this build brings tons of improvements and some new features, which most of you are gonna love with it. 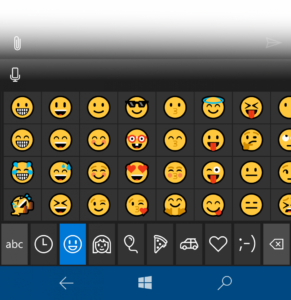 The main thing which I loved in Windows 10 Mobile Build 14322 is the new emoji, lock screen improvements, Eh wait! I actually liked all new improvements included in Windows 10 Mobile Build 14322! Microsoft Edge browser will allow you to re-visit the next page that users visited earlier, by clicking on the option “Go forward”, you can find it by tapping on three dots. Now coming up to Cortana, you will notice that now Cortana comes with its own dedicated settings option in the hamburger menu. Another change, which is worth to mention is that now users will find double touch to wake up option in Lock Screen settings. You will also find Audio routing feature, but you may not able to use as some it is not working on some selected phones. And, yes, Windows 10 Mobile Build 14322 finally adds missing start screen icon in task manager or app switcher. You can now also prioritize app notifications in 3 levels, Normal, High, or Top. There are also few more changes, which my eyes might be missed and some I think, it is not worth to mention. Visual changes to Action Center: Individual app notifications in Action Center no longer show the app icon repeated for each notification and will only be seen in the header that groups together all the notifications specific for that app. This change allows for more space in Action Center to show more content. Visual changes to Notifications: We’re making Action Center richer with support for notifications with more flexible layouts similar to the richness of Live Tiles. Notifications with images will now display larger than they did previously. Notifications can have “hero image” for content that is an even bigger image size to make content in notifications pop even more. 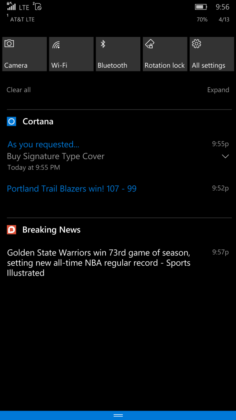 Cortana notifications in Action Center: We have also added new insights from Cortana to ensure you are not missing anything important, such as a meeting conflict or anything she needs to remind you about. Notification prioritization in Action Center: You can manage the notification settings for individual apps by going to Settings > System > Notifications & actions and prioritize which app notifications are more important to you. You can prioritize its notifications to be in one of 3 levels: Normal, High, or Top. You can also adjust how many notifications are visible per app. The default is now 3 per app. If an app has more than 3 notifications, just click or tap to expand and see all notifications for that app. This feature is also available on PC starting with Build 14316. Customize your Quick Actions in Action Center: You can add, remove and re-arrange the Quick Actions that show up in Action Center. To customize your Quick Actions, just go to the Settings > System > Notifications & actions. 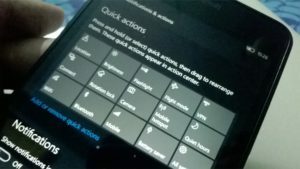 In this settings page, you will see a replica of your Quick Actions as it appears in Action Center, and with a simple press and hold you can move the Quick Actions to the place where you want them to be. Then to add or remove a Quick Action, there is a link below the grid that will allow you to turn on or off the available Quick Actions. 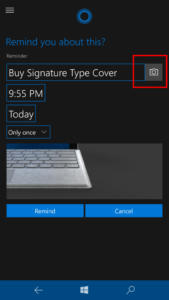 More ways to create Cortana Reminders: We are making it easier and quicker to set a reminder in Cortana with 2 new exciting ways to create reminders. You can now create a Photo Reminder by taking a picture of something you want to be reminded about, like that beer you just tried and want to pick up next time you’re at the store. 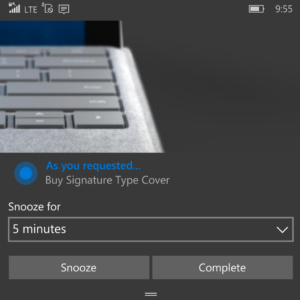 You can also now set reminders on content from UWP apps that utilize the share contract in Windows, like Microsoft Edge and the News app, so you don’t forget to read that article your friend sent you. 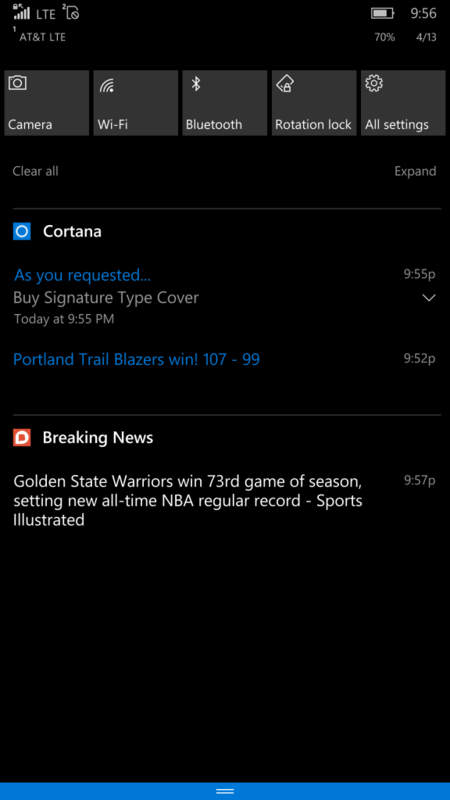 You can share an article from the News app to Cortana and have her remind you to read it at a later time. This even works with photos from your collection in the Photos app! Give it a try. Icons for individual settings pages: All pages in the Settings app now have individual icons associated with them. These individual icons will also be shown when you pin a settings page to Start. And we have also added a dropdown flyout with page suggestions that will appear as you type into the Settings search box. These changes are designed to make it easier to find the settings you are looking for. Navigation bar settings page and vibration setting: We created a page for the navigation bar at Settings > Personalization > Navigation bar. You can now use this page to configure preferences for vibration and double tap the navigation bar to turn off the screen. 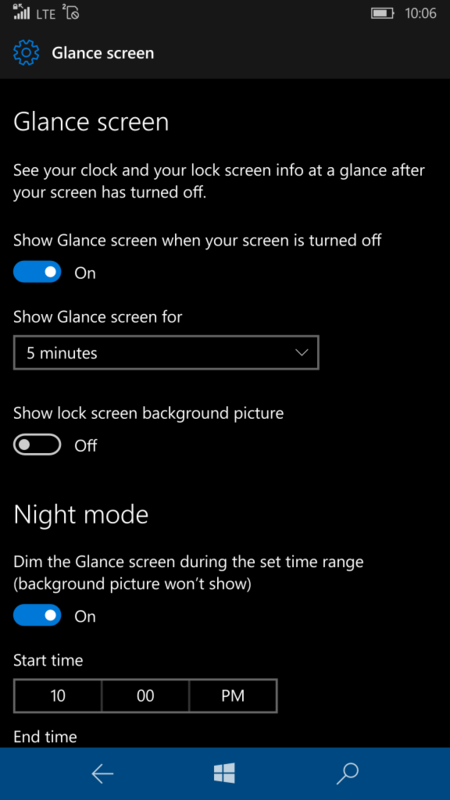 Glance screen settings have moved: As part of our work to make settings more discoverable and user friendly, we’ve simplified the Glance settings options and moved the page out of the Extras section in the Settings app. 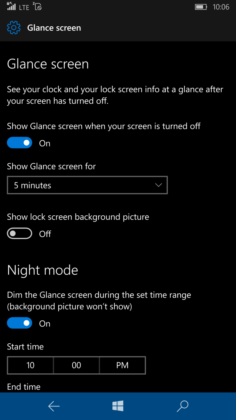 These settings can now be found via Settings > Personalization > Glance screen. 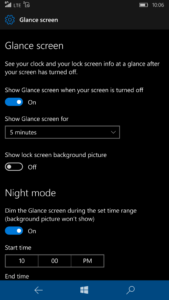 With this change, Glance settings no longer need to be downloaded or updated from the Store. Updated Battery Settings and Battery Saving Experience: Just like what was seen in last week’s PC build, there is now a single entry point for all battery related settings in the Settings app – including Battery Saver. This also includes the updated the Detailed Battery Use page so you can now manage the per-app background settings inline without going to a second page. 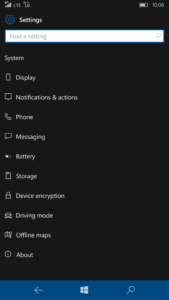 You can also adjust the percentage in which Battery Saver turns on (which is at 20% by default) – something we had with Windows Phone 8.1 that Insiders wanted to see us re-implement as we merged Battery Sense into the Settings app for both PC and mobile. Updated Windows Update Settings: You can now also set the time in which you are most active on your phone just like on your PC by adjusting active hours under Settings > Update & security > Windows Update. 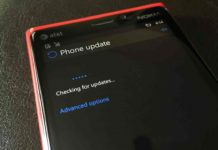 Windows Update will avoid automatically installing updates during your active hours on your device. This build brings our new emoji to your phone. As part of this work, the emoji section of the keyboard has been slightly reorganized to better align with the newly available emoji. It’s now arranged as follows: Favorites, Smileys and Animals, People, Celebrations and Objects, Food and Plants, Transportation and Places, Symbols, and ASCII emoticons. Better copy/paste: We’ve made a couple of improvements to copy and paste on the phone. When you are typing into an edit box on a web page, you will now be able to use the paste button above the keyboard. Also, if you select text on a web page the copy button will appear immediately near the selection. Better tab behavior: Microsoft Edge keeps your tabs under control when you use it with apps on your phone. If you tap on a link in an app that opens a new tab in Microsoft Edge, pressing the back button when you’re done will close that tab, then take you back to the app. Your tabs list stays lean and relevant, by smartly closing tabs you’re done with. You may see an error message the first time you connect. There is nothing wrong with your adapter, and the message will be eliminated in a future update. Not all adapters are supported yet – more will be added in a future update. In this update, you will not see a visual indicator that you are connected, so if you want to double-check that it’s working you can turn off Wi-Fi and cellular data. 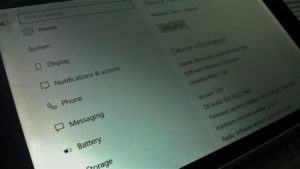 Windows 10 Mobile supports proxy configuration for Wi-Fi and VPN connections. Proxy support for LAN connections will be available in a future update. Camera button on the Lock screen: When your phone is locked, the back button on the navigation bar is now replaced with a camera button. Press and hold this button to launch the Camera app from the Lock screen. Media controls show on top of the Lock screen: We’ve heard a lot of feedback on this so we’re really excited to get this out to Insiders. While you are listening to music, you will now be able to control the music you are listening to right from the Lock screen! If you turn on your phone’s screen, the media controls will now be shown embedded right on top of the Lock screen. Just like on PC, you also have the ability to comment on feedback inside the Feedback Hub on your phone in addition to the responses from our engineering team you have seen in the app already (we call these “sticky comments”). So in addition to up-voting on feedback, you can now comment on feedback too. 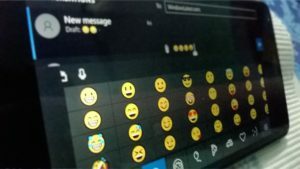 We will soon be enabling a preview of the “Messaging everywhere” feature in Windows 10 that allows you to send and receive text messages from your phone directly from your Windows 10 PCs. 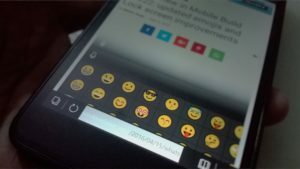 You will see options for this feature in the Messaging app on PC but not on Mobile. A newer Mobile build is required for this experience to fully light up. More to come on this when the experience is live. Windows 10 Mobile Build 14322 worked pretty well on our Lumia 640. 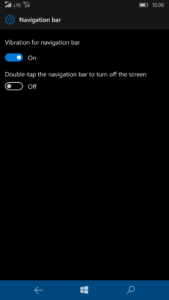 Windows 10 Mobile Build 14322 struggled a little bit as we faced loading and resuming screen for very few seconds, it was not negligible and it might be annoying for you if you are doing an important task in a hurry. As stated in the review of Windows 10 Mobile Build 14295, the major freezing bug in Windows 10 Mobile Build 14322 still exists. When you turn your phone on and pull down the action center, and click on the mobile data toggle, it will make the phone freeze, and restart/soft reset is the only available solution. We fixed an issue resulting in the screen flickering while watching a full-screen video or when you first launched the Camera app. 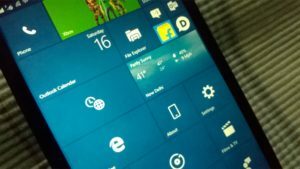 Windows 10 Mobile Build 14322 brings some UI changes, you can notice them at your first glance. Anyways, now, Microsoft Edge address bar includes new tweaks. For example, if you open any of our articles, in URL box it will show starting portion of the URL in black background (dark theme), and sliding the URL will allow you see complete URL of our article in white background, but the UI is still odd and it makes hard to read to complete URL, Microsoft still need to polish it. Also, Settings app includes new UI improvements also, which are worth to mention. Settings in landscape mode also include some UI changes and it now looks more familiar with Windows 10 PC Builds. Language and speech packs are unable to be downloaded and will show errors due to a backend issue. We’re investigating a crash with the Camera app when going into your camera roll. There is an issue in which you may see duplicate apps under All apps showing as pending despite being installed and usable on your phone. You may also see some apps stuck in the Store. You may see square boxes in certain apps when using some of the new emoji – we’re still getting support for the new emoji added throughout the systems, this will be resolved in a future build. In some cases, users might get in a state where neither space or enter are working on the keyboard. If that happens, pressing and holding one of the apps in the All apps list until a context menu appears may resolve the issue. If this doesn’t work, you will need to reboot. UPDATE: There is a bug in this build preventing Tweetium from launching. UPDATE: Facebook Messenger will fail to launch from Start or All apps. As a workaround, you can open Facebook Messenger via the Facebook app or open Facebook Messenger from Cortana. You can also tap on notifications from Facebook Messenger to open the app as well. This bug impacts numerous other Windows Phone 8.1 apps such as WeChat, Transfer My Data, and UC Browser too. Windows 10 Mobile Build 14322 experience on the Lumia 640 was pretty nice. The new Build also comes with its own known issues but new improvements are damn awesome. We hope, most of the Windows Insiders will like this update. We suggest you to upgrade your phone from Windows 10 Mobile Build 14295 to Build 14322, as you will get better performance as well as new features. @mayank Well, i am on build 10586.218. I am facing these problems listed below. 1) the speaker of the phone doesn’t work after the update. 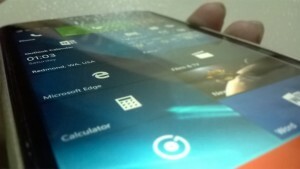 I have tried hard reset but isn’t solved. The sound of the speaker of my phone comes after a week and again goes after sometime. 2) the save as option while playing videos and songs doesn’t respond . It does for pictures but not for videos and songs. I am using lumia 730 indian variant.